Suppose there are only three real goods and services in the economy, and their prices per unit expressed in terms of money were Rs 3, Rs 2, Rs 6 respectively. If those money prices per unit doubled to Rs 6, Rs 4, Rs 12 respectively, we would say inflation of 100% occurred during the relevant time-period. If the prices had gone instead to Rs 4.50, Rs 3, Rs 9, we would say inflation was 50%, and so on. Notice the ratios between the three prices have remained the same in these examples; i.e., while the money prices of the items have changed, relative prices between them remained constant. In reality, there are many hundreds of millions of differentiated real goods and services in any economy though the logic stays the same. It is well within living memory that the monthly salary of a Government of India Joint Secretary was Rs 3,000. Middle class parents would wed their daughters respectably to a groom earning such a figure. A Joint Secretary today makes 20 times as much and Rs 3,000 is made by his driver or children’s nanny whose equivalent back then made perhaps Rs 150 per month. The relative distance between the Joint Secretary and his driver has not decreased but the absolute amount of rupees made by each has been multiplied by a factor of 20. That indicates the fall in the value of rupees or rise in prices of goods and services relative to rupees during that period. One reason this has happened is that the monopoly issuer of rupees, namely the Government of India, has vastly enlarged the stock of rupees present in the economy, both paper-notes and bank-deposits. Inflation, strictly speaking, is uniform decline in the value of money or, what is the same thing, uniform increase in all rupee prices, including wages, with relative prices constant. The time-period could be a year or even a month; “hyperinflation” may start to be defined if the value of money falls at more than 10% per month. The main problem with inflation is that rupee prices never expand uniformly and hence some classes of people gain unexpectedly while others suffer catastrophe. E.g., all those with debts expressed in rupee terms pay back less in real terms while their creditors go bankrupt. Those with fixed or slow-changing incomes (like old people, unorganised non-unionised workers etc) and those with paper assets (like currency rather than land or jewelry) are all made worse off by inflation. Unionized workers, like Government employees, do very well from inflation relative to others in society as their compensation is inflation-indexed. And the Government of India itself, as the largest debtor in the economy, gains massively from inflation; indeed, printing more paper is a standard way for all governments around the world to reduce their real debts by subterfuge. The farmers at Singur or the SEZs who hand over their land for paper rupees from the Government will find the value of that paper declining and the value of that land rising over future years ~ which may help explain the recent keenness of city-people to take over rural India. Rupee prices are one key variable that tend to expand via inflation with expansion of money stock. The other main change occurs in real income through growth. The Joint Secretary and his driver both use colour TVs for entertainment and gas-stoves for cooking these days; their earlier counterparts would have used transistor radios and coal-fired ovens. To that extent, we have superior standards of living than we did in the past. There has been enormous technological progress, mostly through spontaneous learning and productivity increase, and that leads to vastly greater commerce and transactions between people, hence greater income and wealth through specialization. The vastly increased volume and value of commerce requires more money to expedite its turnover. India’s money stock in recent decades has been growing at no less than 15% per annum, most recently reaching an all-time high of 22% per annum last year. Even if current Government estimates of growth of real income at some 9% are taken at face-value, that may mean growth in all rupee prices, i.e. inflation, near 22-9=13% per annum. 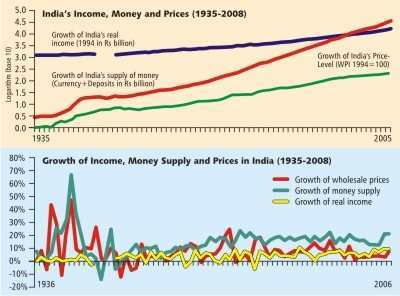 TV economists parrot Government WPI inflation at 5% per annum, and now newspaper headlines are screaming WPI inflation is at 7.4% ~ more realistically, the decline in the value of India’s paper money has likely been in double-digits for years. Paper money is a peculiar thing as it has no intrinsic value ~ even a hair pin or shirt-button has more usefulness as such. Paper money derives whatever value it has only because each of us in the economy believes everyone else will accept it in transactions in payment of wages or to purchase food and other items with. The currency note in your pocket may carry the signature of the RBI Governor and his “promise to pay the bearer” the face-value ~ as if he is going to pay you its equivalent in gold held by the Government. But this is open humbug, a childish fiction. 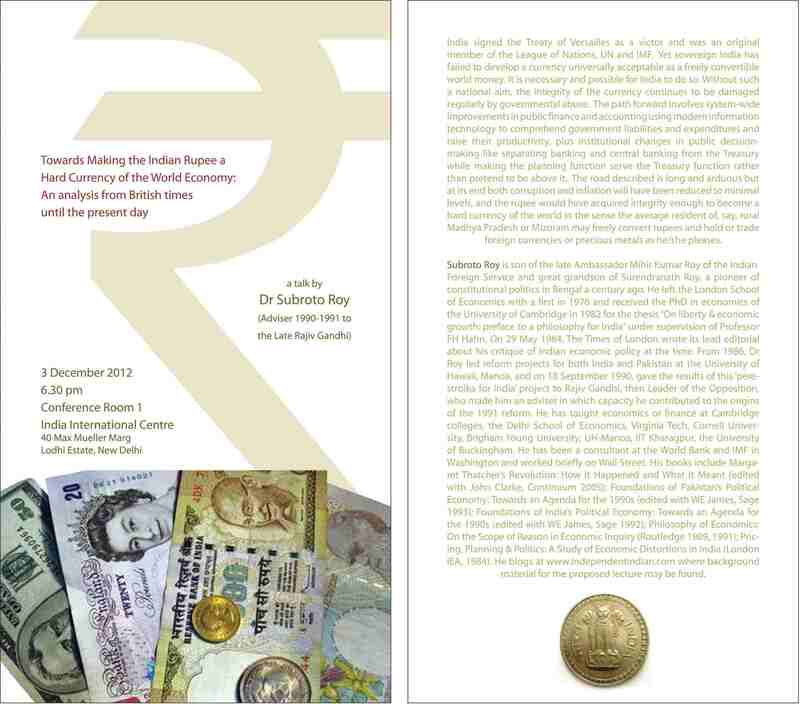 In 1931 the British pound, and the Indian rupee which linked to it at the time, went off the “gold standard” and there has been no backing of the Indian currency with gold ever since then. In a pure gold standard, gold is money ~ interchangeable in the sense the central bank guarantees it will exchange gold for the paper it issues at an announced price. If that price changes up or down, there is devaluation or revaluation of the currency with respect to gold (depending on how you count it). A gold exchange standard is similar except gold is not used as money and central banks of nations guarantee the announced prices of their paper moneys with respect to gold in transactions with one another. In the dollar exchange standard (or Bretton Woods system from 1944 to 1971), the US Government alone and uniquely undertook to guarantee the price of the dollar at $35 a troy oz of gold in transactions with all other central banks. That was the underpinning of the international financial system until Richard Nixon “closed the gold window” on 15 August 1971 because the US had largely financed the Vietnam War through money-creation, and other countries’ central banks (like France) had accumulated large dollar-balances. The “gold standard”, “gold exchange standard”, and “dollar exchange standard” are all examples of “fixed” exchange rate systems which came to end in 1971-1972. The price of gold at $35 an oz was obviously unrealistically low, and it shot up at once, and has even reached $1000 an oz recently. Since 1972, the Western world has been on “floating exchange rates” where currencies find their own values and gold is merely one asset among many. Fixed exchange rate systems can lead to speculation, runs against currencies and the irresponsible international export of inflation which floating exchange rate systems tend to avoid because there will tend to be market-determined movement in the exchange-rate instead. India today has neither a proper fixed nor a proper floating exchange-rate system but instead continues a system of highly discriminatory exchange controls. Twenty or thirty million people in our major cities know how to use the present system well enough to exchange their Indian rupees for as much as US $200,000 per annum to send their children and relatives settled abroad as foreign nationals. Plus Indian corporations have been allowed to convert rupees to buy sinking foreign companies. Foreign-currency reserves have vastly climbed too as domestic Indian companies have been allowed to incur foreign-currency denominated debt. Hence the thirty million special people are rather cleverly able to borrow foreign currency with one hand and then transmit it abroad with the other. The net result is a clear policy of government-induced elite capital flight, unprecedented in its irresponsibility anywhere in world economic history ~ signed, sealed and delivered by the Montek-Manmohan-Chidambaram trio now just as Yashwant-Jaswant-KC Pant and friends had done a little earlier. The Communists would only be worse, as their JNU economists renounce all standard textbook microeconomics and macroeconomics in favour of street-shouting instead. Outside the thirty million Indians with NRI connections, the average Indian today is disallowed from holding foreign exchange accounts at his/ her local bank or holding or trading in gold or other precious metals freely as he/she may please ~ the physical arrest of Mohun Bagan’s hapless Brazilian footballer by our inimitable Customs officers the other day reveals the ugliness of the situation most poignantly. Every TV economist in Delhi, Bombay and Kolkata now seems to have a solution about India’s inflation and all sorts of fallacious reasoning is in the air. Some recommend the rupee appreciating or depreciating ~ as if anyone in the country has the faintest idea how elastic imports, exports and capital flows may be in fact to changes in the (controlled) exchange-rate. The Finance Minister and PM keep saying inflation is being “imported” because international commodity prices are high ~ someone should explain to them inflation is “imported” when fixed exchange rates allow transmission through the price-specie flow mechanism, and that is far from being India’s main problem. The extra-constitutional “Planning Commission” has, we may be thankful, remained silent about inflation, and seems to have abandoned earlier misconceptions about using forex reserves for “infrastructure”. The UPA Chair, we may be thankful, also has been silent and admits innocence of all economics, implicitly trusting her PM’s wisdom in all such matters instead. What no one wants to talk about is the hippopotamus that is present in the room, namely, the chronically diseased state of accounts and public finances of the issuer of India’s paper-rupees, the Union Government, as well as the diseased accounts and finances of more than two dozen State Governments that are subservient to it. The macroeconomic and fiscal policy process that the Congress, BJP, Communists and everyone else in the political class in New Delhi and the State capitals have been presiding over for decades is one that turns normal economics upside down. 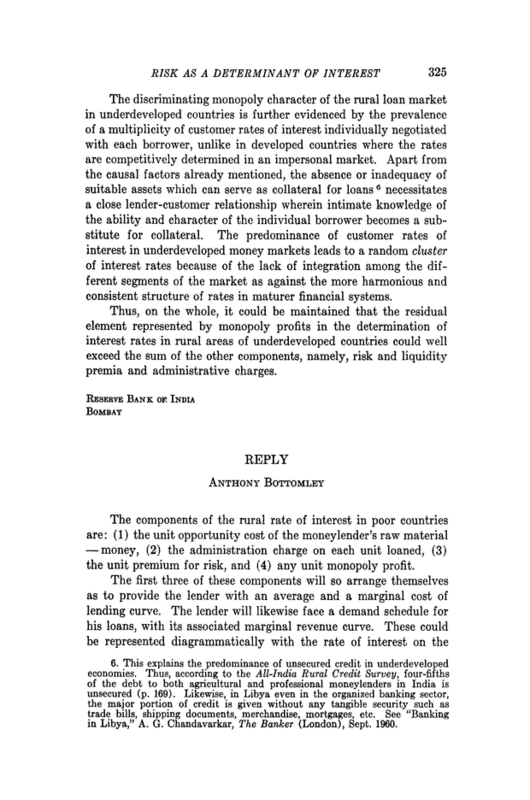 What happens in the West is that an estimate of technological progress and population growth is made by policy-makers, then an “acceptable” or “unavoidable” or “natural” rate of inflation is added (the figure of monetary change needed for efficiency in the real economy so relative prices adjust to equilibrium in response to demand and supply changes), then a monetary growth target is set, to which the fiscal authority ~ i.e. the legislature handling the Government’s budget ~ must adjust taxation and spending plans accordingly. What has been happening in India every year for decades is that each of some two dozen state legislatures runs up a large deficit, which are all added up and passed on to the “Centre”; the “Centre” and its “Yojana Bhavan”, at the behest of every conceivable organised interest-group with access in Delhi especially government unions and the military, runs up its own vastly larger fiscal deficit, and then this grand total of fiscal-deficits is offered to the Reserve Bank at the end of a loaded pistol ~ to pay for one way or another via new public debt creation and money printing. Subtract the WPI rate from the Money Supply Growth rate and government spokesmen and their businessmen friends then exclaim that the economy must try to reach the difference as its “warranted” growth rate! It is all economics upside down from people who have either learnt nothing significant in the subject or forgotten whatever little they once did. The net result has been a banking system (mostly nationalized) in which the asset side of banks’ balance-sheets is made up almost entirely of rather dubious government debt, interest payments on which are received every year from fresh money-printing. 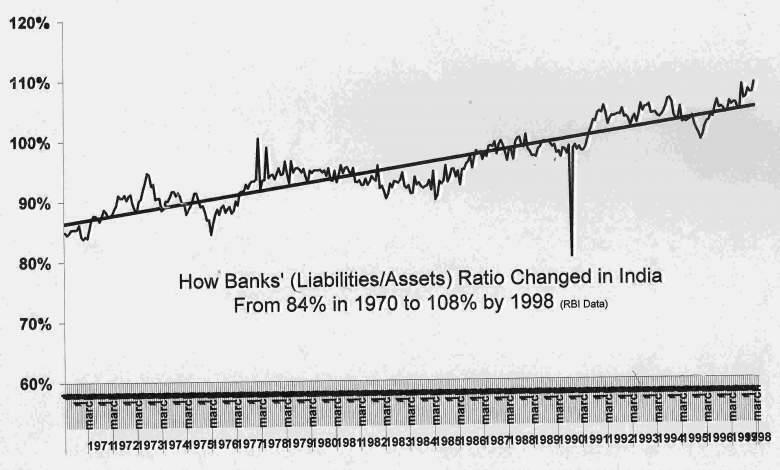 The liability side of those balance-sheets consists of course of customer-deposits. In this fragile monetary and financial state, a government-induced capital flight has been allowed to continue under pretence of liberalization ~ with Indian companies being allowed to borrow from foreign markets many times their domestic rupee-denominated net worth by which to acquire ailing foreign companies and brands. Furthermore, there has been a massive fiscal effect as vast new Government spending programs ~ like buying foreign aircraft carriers, fighter-jets or passenger aircraft or writing off farm loans ~ come to be announced and absorbed into expectations of future inflation. A monetary meltdown is what the present author cautioned against in 1990-1995 and again, publicly, in 2000-2005. Economics, candidly treated, tells us not only that there is no such thing as a free lunch but also that chickens come home to roost.